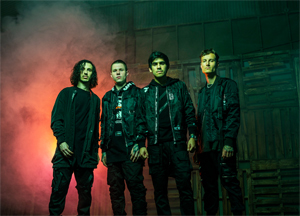 CROWN THE EMPIRE are back. The band just dropped the absolutely epic new song + video for "20/20". Watch + listen on KNAC.COM HERE. This marks the band's first new music since the release of the 2016 fan favorite Retrograde. "I started to feel like I was living in a world where, even though we're more connected than ever, I felt more alone than ever," said singer Andy Leo about the personal and poignant track. "It's too easy to point the finger at vanity and self-obsession in technology, all the while being just as much a part of it." Leo continued, "This is a letter to myself to remind me that I'm still human first. Thanks to everyone for sticking with CROWN this far. I hope you enjoy this one." The Dallas, Texas band is spending its summer on the final traveling edition of the Vans Warped Tour, which runs through August. All CROWN THE EMPIRE Warped dates are below. The band will head over to Europe from September 18 through October 12. The band will announce further details about its next album, due out via Rise Records, shortly.